Why Are Some People Afraid To Eat Rare Bloody Steaks? Just smile. Anyone who thinks steaks contain blood, well, they’re wrong. They’re not necessarily wrong in their preference for eating well-done steaks, although many would argue that such behavior should be declared a felony. Where they’re wrong is in calling your steak bloody. There’s practically no blood in it at all. Blood, you might politely remind them, is that red liquid that circulates through the veins and arteries of a living animal. Not to get too gross about it, but in the slaughterhouse, just as soon as the animal is zonked, they drain out virtually all of the blood except for what remains trapped in the heart and lungs, which, we devoutly hope, are of minimal gastronomical interest to you and your friends. 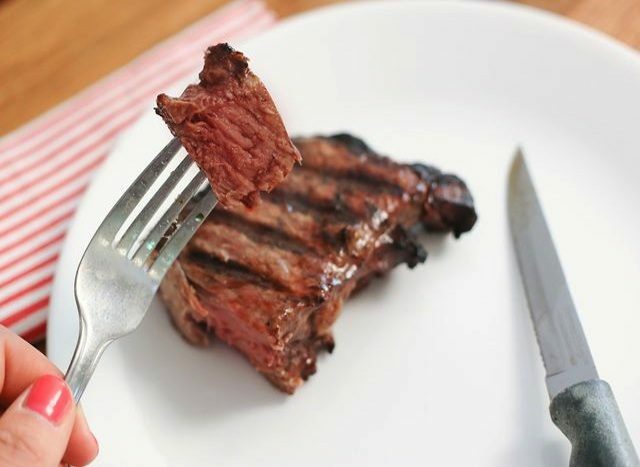 When you order a steak, you’re ordering muscle tissue, not circulatory-system components. Blood is red because it contains hemoglobin, an oxygen-carrying protein. The red color of muscles, however, is due to a chemical compound called myoglobin, a protein that stores up oxygen on the spot, right in the muscles, for whenever they might need it for a sudden burst of energy. Various meats contain various amounts of myoglobin, because various animals have varying degrees of need to store oxygen in their muscles for bursts of energy. Pork (those lazy pigs!) contains less myoglobin than beef, chicken has even less, and fish has less still. So there are red meats and there are relatively white meats. Ask your friends to explain that in terms of bloodiness. Why is Kentucky called “the dark and bloody ground” and Where did the nickname come from? Why Is Gold So Rare, Where Does it Come From, and Why Is Gold Found Everywhere?